In 1846, one year after New Braunfels was founded, a mercantile company owned by James Ferguson and Henry Hessler opened on the corner of Castell and San Antonio streets. By 1858, both men had died and Ernst Scherff, an employee, purchased the business from Ferguson's widow. 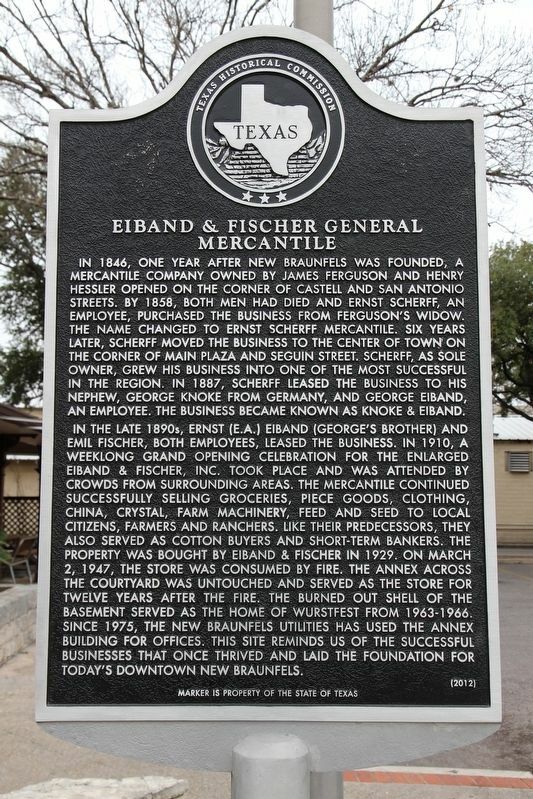 The name changed to Ernst Scherff Mercantile. 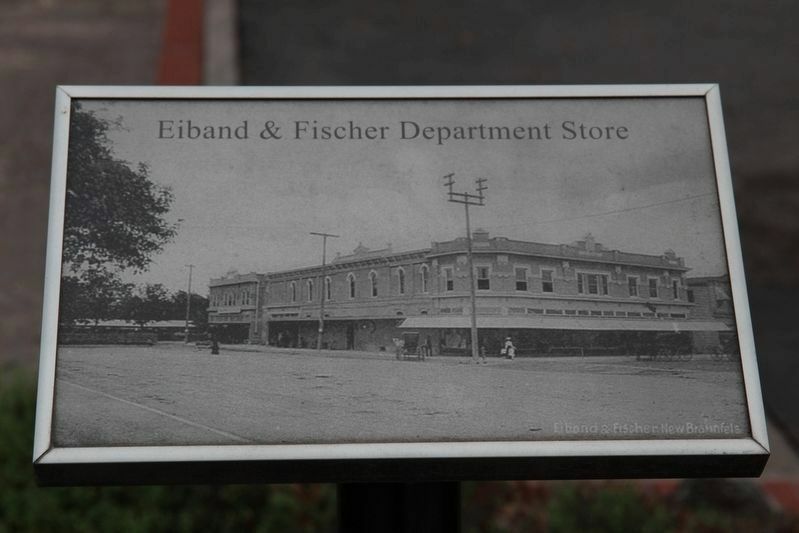 Six years later, Scherff moved the business to the center of town on the corner of Main Plaza and Seguin Street. Scherff, as sole owner, grew his business into one of the most successful in the region. In 1887, Scherff leased the business to his nephew, George Knoke from Germany, and George Eiband, an employee. The business became known as Knoke & Eiband. cotton buyers and short-term bankers. The property was bought by Eiband & Fischer in 1929. On March 2, 1947, the store was consumed by fire. The annex across the courtyard was untouched and served as the store for twelve years after the fire. The burned out shell of the basement served as the home of Wurstfest from 1963-1966. 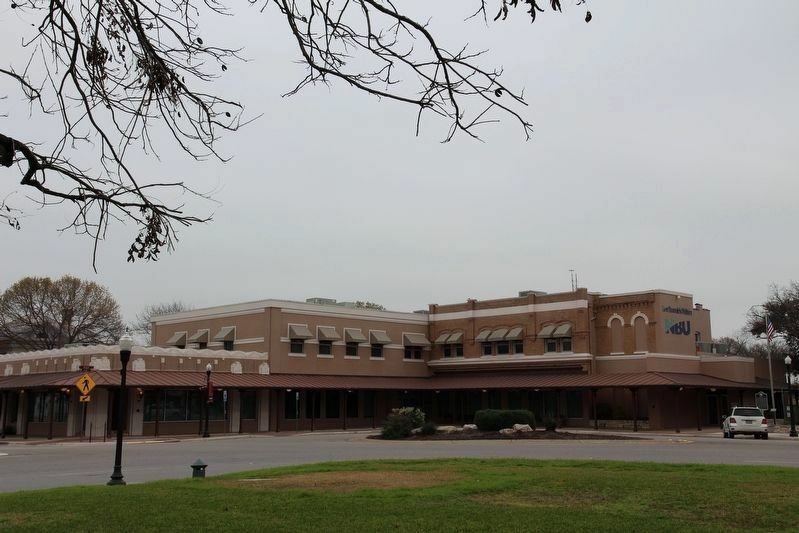 Since 1975, the New Braunfels Utilities has used the annex building for offices. This site reminds us of the successful businesses that once thrived and laid the foundation for today's downtown New Braunfels. Location. 29° 42.183′ N, 98° 7.439′ W. Marker is in New Braunfels, Texas, in Comal County. Marker is at the intersection of East San Antonio Street and Main Plaza, on the right when traveling north on East San Antonio Street. Touch for map. Marker is at or near this postal address: 263 Main Plaza, New Braunfels TX 78130, United States of America. Touch for directions. (about 400 feet away); Hinmann House (about 600 feet away); Early Settlers' Home (about 600 feet away); Spaß und Gemütlichkeit (about 700 feet away). Touch for a list and map of all markers in New Braunfels. More. Search the internet for Eiband and Fischer General Mercantile. Credits. This page was last revised on February 26, 2019. This page originally submitted on February 20, 2019, by Brian Anderson of Kingwood, Texas. This page has been viewed 42 times since then. Photos: 1, 2, 3. submitted on February 21, 2019, by Brian Anderson of Kingwood, Texas.